Wobble boards build confidence and sure-footedness. "They wobble, but they don't fall down!" While that old advertising phrase refers to people toys, a wobble board for dogs is an agility and fitness tool used to teach balance, coordination and flexibility, while building core strength for sport or therapeutic purposes. Wobble boards are very simply designed to move just a bit when a dog or puppy steps on them. They vary from boards made at home with a piece of plywood attached to a PVC pipe or tennis ball all the way to mass-produced commercially made boards. No matter how your board is designed, it should move just a bit when touched and have a non-slip surface for safety. Color, shape and exact size can be modified to suit your preference. Introduce your dog to the wobble board slowly and keep thing upbeat and positive. 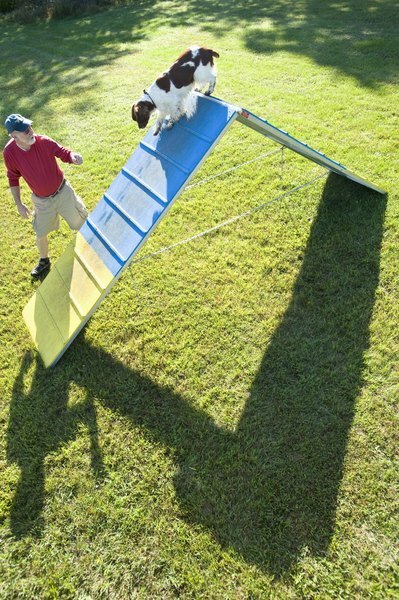 Begin by luring your pooch onto the board with treats and reward her when she steps onto the board. Praise your pup enthusiastically every time she touches the board, and slowly she'll begin to linger with first one foot, then two feet, and eventually, all four feet on the board. The younger your dog is when you begin working with a wobble board, the easier time you'll have. Never fear, though, because old dogs can definitely learn new tricks! Practice frequently until your dog happily and readily steps on the board with all four feet and will stay there without fear. Wobble board exercises are limited only by your imagination and the goals you have for your dog. Popular exercises for agility training include having your dog run to the board, jump on and freeze from a distance, changing positions on the board and practicing contact exercises. For therapeutic or rehabilitation work, first make sure your dog is medically cleared to practice on a wobble board. Once cleared, any exercise that builds balance or core strength provides therapeutic benefit. Frequently used exercises may include simply standing on the board for a set amount of time, targeting the board with either front or back feet, and changing positions on the board. Popular positions for wobble board training are sit, down, stand, sit pretty, bow, standing on hind legs and handstands. Primary benefits of wobble board use include increased back and core strength, exceptional balance, sure-footedness on moving objects and increased flexibility. However, there are mental benefits for your dog as well. Increased confidence is a huge benefit, as well as better self-regulation in unfamiliar situations. While teaching and practicing wobble board exercises, you learn to communicate more clearly with your dog while having fun and bonding. Can a Puppy Outgrow Fear & Growling?